The following is a guest post by AMA Bookstores Coordinator Claire Ochse introducing us to the vernacular of autographed books. As authors of business books frequently visit American Management Association centers, AMA Bookstores have been increasing the number of autographed books for sale on our shelves. However, readers are often not sure what differentiates an autographed copy they purchase in a store or at a book signing from the books being offered for thousands of dollars at auctions. 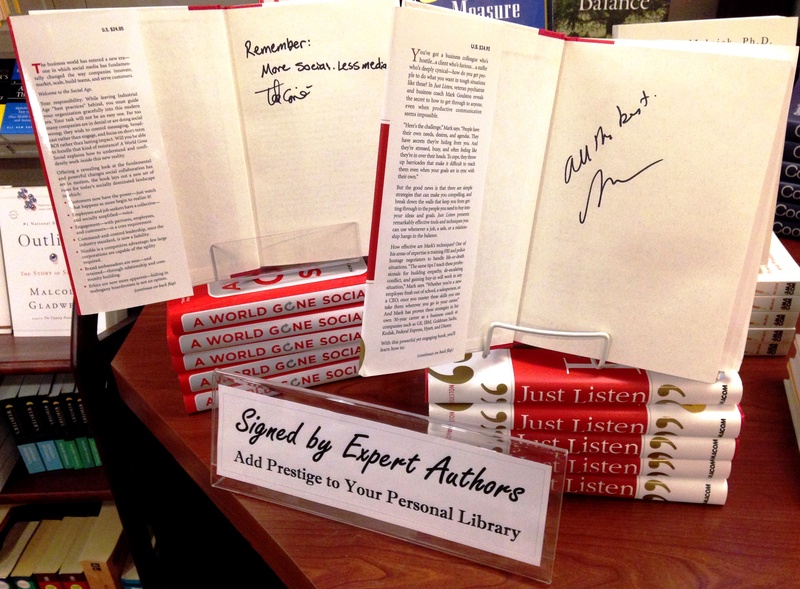 Signed or autographed books are exactly what they sound like. The author, or someone else directly involved in the creation of the book like an editor, illustrator or co-author, signs the book with their name. Signatures may also include the date of signing and flourishes like a brief quote or a small drawing. Authors may autograph many copies of their books all at once to sell or give away at special events or offer them exclusively from certain bookstores. Inscribed books are also signed by the author, but have a message written to a specific person, at the request of that person. If you attend a book signing, an author will usually make a personal inscription in your book. An association copy has been signed by the author to someone associated with the author, perhaps a friend or colleague. These types of inscriptions are of extra value and significance if the “associate” is also someone of importance, perhaps a fellow author or historical figure. A dedication copy is similar to an association copy, but is inscribed to the person to whom the book is dedicated. These are extremely rare and often more valuable than association copies. A presentation copy has been signed by the author, inscribed with a message to a specific person, and given to the person as a gift. Bookplates are stickers or labels attached to a book, traditionally used to identify the owner of the book. Increasingly, however, authors will offer signed bookplates as a promotional tool, in addition to or in lieu of traditional book signings. Popular authors can encourage their fans and online followers to buy their books by offering to send signed book plates with each purchase. Claire Ochse is an Events Management Coordinator for AMA Bookstores, specializing in business, professional, and self-development books. You can follow AMA Bookstores on Facebook and Twitter.